The author joined the United States Naval Academy in 1935 and graduated in 1939 as the most junior of officers. After a short period onboard a cruiser he joined an old destroyer, the USS William B Preston, which was being converted into a seaplane tender in New York. 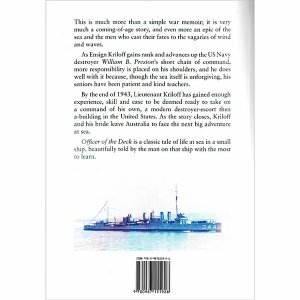 On completion Kriloff joined the ship which sailed to Hawaii. 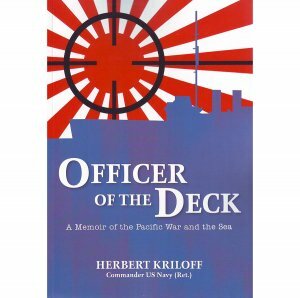 He was one of just a handful of officers onboard the small ship, and he tells a wonderful story of life at sea in those days, conveying the responsibilities and fears as he learnt while serving as an officer of the deck. Then in 1941 the ship joined the Asiatic Fleet based in Manila. The ship was bombed on the very first day of the war and then retreated to Australia, the Japanese always close behind. The ship was present during the bombing of Darwin on 19 February 1942, and was very nearly sunk. However it survived to reach Fremantle and then eventually Sydney where it spent some months being repaired. At this time a love story emerges, as Kriloff meets an Australian woman whom he will eventually marry. The ship returned to WA and served as a forward base ship on the isolated coasts of Australia's north west. A unique and very readable story, told in the language of the day. This is a new edition. The book was originally published in North America but has been unavailable for some time.